Peters Spares Model Railways Ltd. Graham Farish 370-425 Midland Pullman Train Pack N Gauge. Train Pack Details: Era 4 Midland Pullman 6-Car Unit Set Exclusive Bound History Of The Midland Pullman Pack Of Pullman Stewards And Train Crew Collectable Reproduction Menu Card And Fine Art Print Numbered Certificate Warrenty Card Manual 6 Pin DCC Ready (This item is Discontinued from the Graham Farish range). How it started; I have been interested in model trains since I was a child. My dad gave me the train bug. It was more fun and much cheaper, now I can fix most locos so they run like new. Used model railways & collections always wanted. Drop us a line or just pop in for a visit to Peters Spares Model Railways ltd where our staff who are all railway modellers are always happy to help. Or sign up to my shop newsletter. Thanks From Peters Spares Model Railways Ltd. It has a selection of choices relating to your country of origin & a quantity option. Instead, please request or await an invoice. If you are purchasing from overseas please request an invoice before paying for combined orders. IV2, AB41-45, 51-56, FK19-21, IV1-20, 25, 30-37, 54, 63 KW1-3, 6-10,14, PH15-26, 33, 49, 50. We are sorry about this, but there are a lot of timewasters out there who spoil it for the other honest eBayer's. Please note delays are possible around the bank holidays. For items that are not faulty. These Regulations apply in relation to contracts entered into on or after that date. The cancellation period ends as follows for sales contracts; the cancellation period ends at the end of 14 days after the day on which the goods come into the physical possession of, (a) the consumer, or (b) a person, other than the carrier, identified by the consumer to take possession of them. Exercise of the right to withdraw or cancel. To withdraw an offer to enter into a distance or off-premises contract, the consumer must inform the trader of the decision to withdraw it. To cancel a contract of sales under regulation 29(1) Of, The Consumer Contracts (Information, Cancellation and Additional Charges) Regulations, the consumer must inform the trader of the decision to cancel it. It is not Peters Spares responsibility to collect the goods, the consumer mustâ (a) send them back, or (b) hand them over to the trader or to a person authorised by the trader to receive them. The consumer must bear the direct cost of returning goods. The address to which goods must be sent is, Peters Spares Model Railways Ltd, Unit 2J Brighouse Business Village, Riverside Park, Middlesbrough, TS2 1RT, without undue delay and in any event not later than 14 days after the day on which the consumer informs the trader of the cancellation. Peters Spares Model Railways Ltd, fully complies with, The Consumer Rights Act 2015. The Consumer Rights Act 2015 became law on 01 October 2015, replacing three major pieces of consumer legislation - the Sale of Goods Act, Unfair Terms in Consumer Contracts Regulations and the Supply of Goods and Services Act. The following are statutory rights, under a goods contract. Goods to be of satisfactory quality. Goods to be fit for particular purpose. Goods to be as described. Other pre-contract information included in contract. Goods to match a sample. Goods to match a model seen or examined. Trader to have right to supply the goods etc. If statutory rights under a goods contract are not met. Consumerâs rights to enforce terms about goods. Time limit for short-term right to reject. Right to repair or replacement. Right to price reduction or final right to reject. 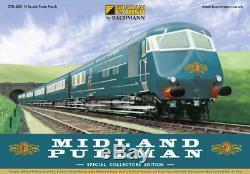 The item "Graham Farish 370-425 Midland Pullman Train Pack N Gauge" is in sale since Wednesday, February 28, 2018. This item is in the category "Collectables\Model Railways & Trains\N Gauge\Starter Sets & Packs". The seller is "petersspares" and is located in UK. This item can be shipped to United Kingdom.